Long before Motown had the Four Tops “Standing in the Shadows of Love,” there was not one but two groups called the Four Toppers. The membership of the earliest group using this name both overlapped with and was outnumbered by the better-known Five Red Caps. 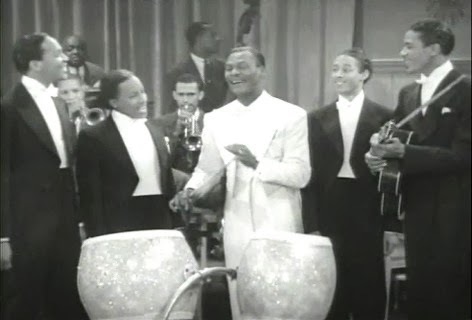 Fans of early doo wop and black vocal groups can not only hear but see this edition of the Four Toppers in the 1940 film Mystery in Swing, but the real intrigue seems to have been all the legal maneuverings and wranglings involving management of both the aforementioned quartet and quintet. 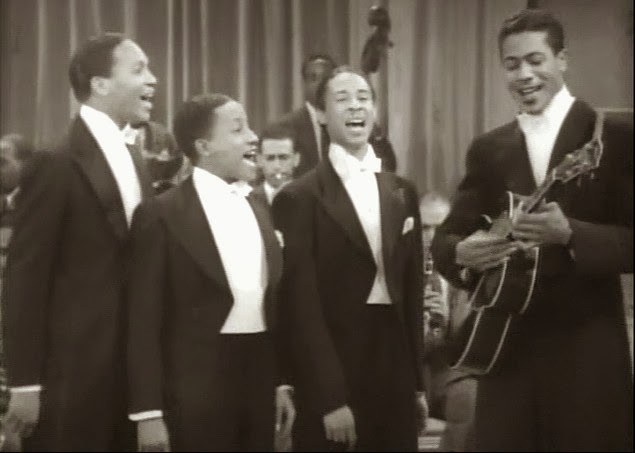 This set of Four Toppers, whose records include a pair of musical invitations, “Jump, the Water's Fine” and “Let's Go to a Party,” should not be confused with the Four Toppers who eventually evolved into greater success as another vocal group called the Four Fellows. 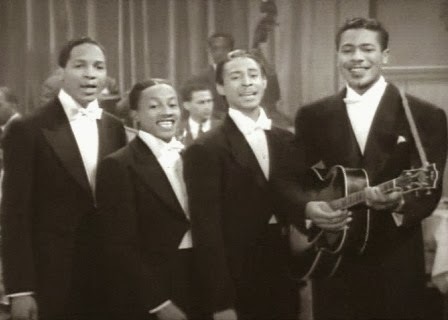 While the membership of the latter group was still crossing themselves with the jubilee gospel style of singing in the ‘40s, not yet using the name of the Four Toppers, the actual Four Toppers of the time had already been active performing in Hollywood films since the late ‘30s, often as a vocal group within the large band of Cee Pee Johnson. 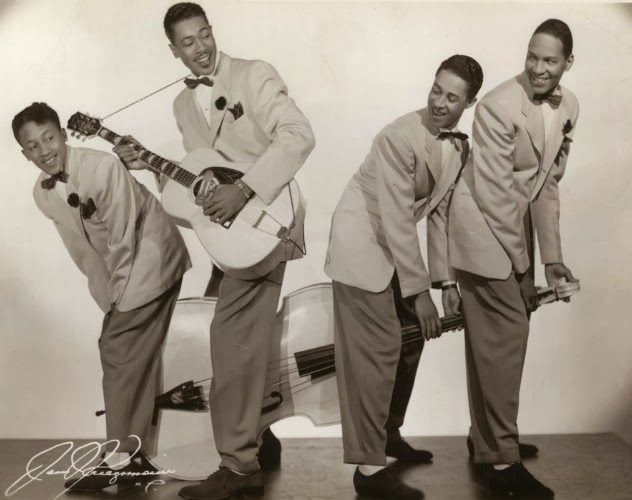 One difference between the two name-alike combos would be the matter of instrumentation; while the later Four Toppers was an all-vocal group, the earlier band involved on-stage instrumentalists including the Philadelphia pianist Romaine Brown and the superb bassist Doles Dickens. Songwriter, guitarist, and singer Steve Gibson led this outfit; he as well as tenor Jimmy Springs and the bassist and vocalist Dave Patillo were also members of the Five Red Caps. When that group began a prolific recording release schedule in 1943, the management agency headed by Nat Nazarro began legal battles with producer Joe Davis. Nazarro had a pact with the quartet, but Davis' bond with the quintet had assumed a life of its own based on the fact that Gibson and company had not balked at recording compositions written by Davis, resulting in several hits during the ‘40s.